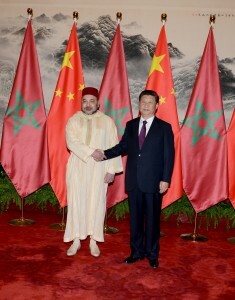 King Mohammed VI with President Xi Jinping in Beijing. Washington, DC, May 13, 2016 (MACP) — On Thursday during an official visit to Beijing, Morocco’s King Mohammed VI presided over the signing of 15 public-private partnership agreements between Morocco and the People’s Republic of China. The King also announced that, in the interest of improving the two countries’ relationship, Chinese citizens will no longer require a visa to visit Morocco. Haite Group, Morocco-China International and BMCE Bank of Africa to set up a Chinese-Moroccan industrial park in Morocco and a Chinese-Moroccan investment fund targeting the aeronautics, finances, industrial parks and infrastructure sectors; and more. Over the last two decades, Morocco has taken steps to become a business hub in Africa, investing in infrastructure and sector-specific education, expanding business relationships throughout the continent while courting foreign investment. And the work has paid off. In April, French automaker Renault announced a major new expansion of existing investments in the country, expanding operations alongside other big names like Bombardier and Boeing who also have a presence there.